Reimagine 2018, San Francisco – April 17, 2018. We were invited to create an event as part of a week-long community effort called Reimagine End of Life featuring over 150 events across San Francisco. Ours was the only nonprofit dedicated exclusively to grief for our animal companions. Entitled ‘Honoring our Pets,’ we inaugurated a participatory, large-scale, public, kinetic art piece at beautiful Ocean Beach. We also conducted participant interviews, which will become an integral part of this project, Reimagine held another event in New York City, but we could not attend due to lack of funds. L.A. Nature Fest – March 18, 2018. Each year, the Natural History Museum in Los Angeles hosts the L.A. Nature Fest to explore the wild side of L.A. We could not afford to secure a table, but Alison Stern Simard, co-founder of Citizens for Los Angeles Wildlife (CLAW), who also works for L.A. City Councilmember Paul Koretz (a friend of animals and our Society), supports our efforts to promote conservation whole-family cemeteries, and graciously invited us to put our information on CLAW’s table. Thank you Alison! Our work continues to gain significant recognition by other organizations, the press and bloggers. The Order of the Good Death – we are honored to have been listed in The Year of Action Resource Guide (February 10, 2018). petMD featured our work in their column, Eco-Friendly Pet Burials (August 3, 2018). “Greener Pet Burial: Why Not?” by Doug Moss and Roddy Scheer, in EarthTalk. Reprinted as “EarthTalk: Options for a ‘green’ pet funeral” in StudyHall.Rocks. “Thinking About Having a ‘Green’ Funeral? Here’s What you need to Know” by Richard Wagner, in The Amateur’s Guide to Death & Dying. “My dog just died — what do I do?” (Part 1) by Namrata Kolla, in The Forever Spot by Coeio. “Legally burying pets & the Green Pet Burial Society” in The Forever Spot by Coeio. We added a new whole-family conservation cemetery to our directory – good news for North Carolinians! Carolina Memorial Sanctuary, Mills River, NC. Pet remains may be buried alongside human remains. They also have a separate pet section entitled Pet Memorial Garden. We have been notified of other cemeteries and will add them soon. 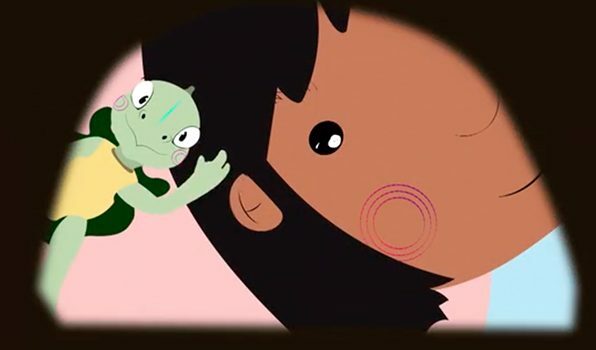 Anais, a young Costa Rican girl, faces the hardest decision she’s ever had to make: should she sneak her best friend and pet turtle Tiku across the U.S. Miami border, or should she leave him behind? Anais’ relationship to the natural world around guides her through this heart wrenching decision, and the consequences that follow. Be sure to visit the other videos, artwork, and poetry in our Art Galleries. Make a donations today vis-a-vis our host organization, Family Spirals. Wishing you a joyous 2019! 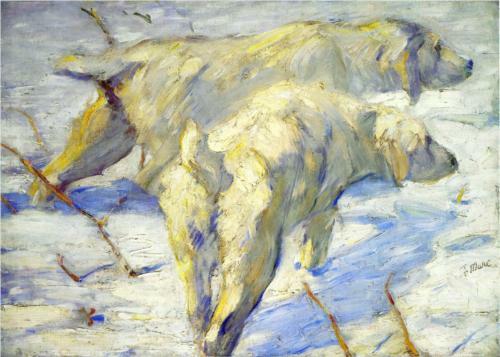 images: Franz Marc. Siberian Sheepdogs. c.1910. oil on canvas. 80.33 x 113.98 cm. National Gallery of Art – Washington DC. still from the film Caracol Cruzando, by Pamela Maria Chavez.